Flat, Mannequin or Live Model. Which Is Right For You? We all know that displaying your products in the correct way online will lead to increase sales. Clothing provides it’s own unique challenges and can be fraught with difficulties. It is essential that you make the right decisions early on in how you are going to display your clothing products. There are a number of factors to consider when you are planning to photograph your clothing products. These include your brand Style, the products you are displaying and also the associated costs. In this post we will explain the different methods in which you can photograph clothing for your e-commerce store. Discover which types of clothing suit each method and also the pros and cons of each method. We all know how a brick and mortar store differs from an online store. When a potential customer walks into a physical clothing store they are able to see the products from all angles, to see how light affects the product, get a feel for the product and most importantly try the product on. It is a very physical experience. When it comes to your online store, you are severely restricted in what you can convey through a screen. You need to provide appealing, extremely high quality and consistent product images in order to capture your potential customers attention and convert them into sales. Your product shots need to remain realistic in order to help a potential customer visualise the product that they could be wearing. Producing images for an e-commerce can be difficult, but you need to keep the process as simple as possible. Poor product images need to poor conversions and an overall loss of profit. To counter this, and help increase sales, there are number of ways of presenting your clothing products online. Using hangers, multiple angles, laying items flat, using real-life models and ghost mannequins/invisible mannequins. Successful clothing retailers use one or a combination of these techniques. Which technique works best? This depends on a number of factors including the products you are trying to sell, your target market etc. To help you improve your online sales we discuss a breakdown of the benefits and weaknesses of each technique. This is a common choice for low budget business’s or businesses just starting out. The mistake these companies make is that simply laying your product items flat and not thinking through how the final product will look will be enough to get conversions. It is true that this is a comparatively simple photography setup and also simple for high volumes. In order to get Professional looking results from flat laid clothing you need to use a stylist. You also need to remove the backgrounds from the products in order to make the product stand out and be consistent for your website branding. Traditionally taking flat laying shots requires a photo setup with your camera pointing towards the ground. Usually you also require a lighting setup. The stylist will lay out the product and improve the appearance using a number of tools such as clips and tape to shape the product. You still need to make a prop look like it is being worn as best you can. Stylist usually use tricks such as folding cloth under the arms and puffing out the clothing using tissues or other filling material. The invisible mannequin or ghost mannequin technique is used to show how the clothing will look when it is warn. The technique gives the impression that an invisible man or woman is actually wearing the clothing. The technique is relatively simple to style as the shape has already been created, the downside is that it uses a large amount of processing time to achieve the final result. Many professional retailers use this method due to the simplicity of the styling involved. The most common of invisible mannequin editing requires the use of Two images one on the inside and one on the outside. By performing some clipping path work the two images can be fused together as in the image below. You can also purchase “ghost mannequins” that already have the neck removed like the image below. These ghost mannequins save on the additional post production editing. You can remove specific parts from the mannequin such as the neck and chest area to achieve the desired effect without spending time flipping out and fusing your images back together. Invisible mannequin shots are more specifically used for products such as dress shirts, jackets, coats and blazers. The technique shows off inner details such as linings and pockets. Using real-life model for your product photography is the best solution for showing real shape and look for products. A human model will show how the clothing hangs from the body and is shaped. Significantly this type of Technique can also support your brand image and provide a distinctive look. The obvious downsides are that the model can distract from the actual product itself. Live models of course an additional expense and can be relatively expensive to hire. So Which Clothing Photography technique Should You Choose? To help you decide we have created a list of various products and the technique that works best with each in our opinion. The above table gives you a good idea where to apply each technique for different products. You can of course use a combination of techniques. 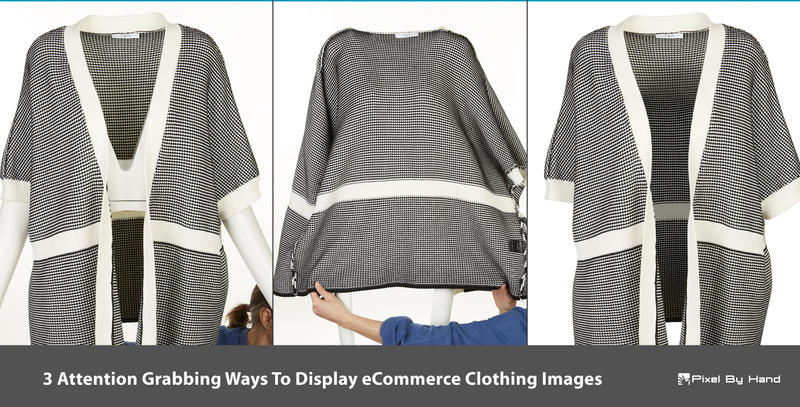 Many e-commerce combine live models together with flat Laying or invisible mannequin images. This allows to show a product in a wider range of contexts. It may not be cost-effective for some, though this combination brings the benefits to potential customers of a greater variety of images. If you need any further help or if you have any questions which techniques would suite your ecommerce website best then you can contact us here.